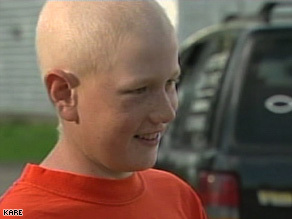 Dad tells court mom said she and son were leaving "for a time"
(CNN) -- A Minnesota judge issued an arrest warrant Tuesday for the mother of Daniel Hauser, a 13-year-old boy who is refusing treatment for his cancer, after neither she nor the boy showed up for a court appearance. Doctors say Daniel Hauser's lymphoma responded well to a first round of chemotherapy in February. "It is imperative that Daniel receive the attention of an oncologist as soon as possible," wrote Brown County District Judge John R. Rodenberg in an order to "apprehend and detain." "His best interests require it," Rodenberg wrote. The judge had scheduled the hearing to review an X-ray ordered by the court to assess whether Daniel's Hodgkin's lymphoma was worsening. The boy's father, Anthony Hauser, did appear at Tuesday's hearing, where he testified that he last saw the mother, Colleen Hauser, at the family's farm on Monday night, when she told him she was going to leave "for a time." He said he did not know where they had gone. During the hearing, Dr. James Joyce testified he saw the boy and his mother on Monday at his office. He said the boy had "an enlarged lymph node" near his right clavicle and that the X-ray showed "significant worsening" of a mass in his chest. In addition, the boy complained of "extreme pain" at the site where a port had been inserted to deliver an initial round of chemotherapy. The pain was "most likely caused by the tumor or mass pressing on the port," testified Joyce, who called the X-ray "fairly dramatic" evidence that the cancer was worsening. Rodenberg ordered custody of the boy transferred to Brown County Family Services and issued a contempt order for the mother. A call to the family's home in Sleepy Eye, Minnesota, was not immediately returned. Philip Elbert, Daniel's court-appointed attorney, said he considers his client to have a "diminished capacity" for reasons of his age and the illness and that he believes Daniel should be treated by a cancer specialist. Elbert added that he does not believe Daniel -- who, according to court papers, cannot read -- has enough information to make an informed decision regarding his treatment. Daniel's symptoms of persistent cough, fatigue and swollen lymph nodes were diagnosed in January as Hodgkins lymphoma. In February, the cancer responded well to an initial round of chemotherapy, but the treatment's side effects concerned the boy's parents, who then opted not to pursue further chemo and instead sought other medical opinions. Court documents show that the doctors estimated the boy's chance of 5-year remission with more chemotherapy and possibly radiation at 80 percent to 95 percent. But the family opted for a holistic medical treatment based upon Native American healing practices called Nemenhah and rejected further treatment. In a written statement issued last week, an attorney for the parents said they "believe that the injection of chemotherapy into Danny Hauser amounts to an assault upon his body, and torture when it occurs over a long period of time." Medical ethicists say parents generally have a legal right to make decisions for their children, but there is a limit. "You have a right, but not an open-ended right," Arthur Caplan, director of the center for bioethics at the University of Pennsylvania, said last week. "You can't compromise the life of your child."